In 2012, Amadeus Acoustic Solutions were contacted by James Dinwiddie of Dinwiddie Maclaren Architects to construct 3 modular music rooms for Finton House School in London. The biggest obstacle with this project was a lack of space. The architects decided that instead of building up a new structure for the music department, they would have to tunnel under the children’s play ground; turning the site into a subterranean music department. This was no mean feat and the results were impressive. The music department received beautifully designed rehearsal rooms from Amadeus and the school was able to keep it’s much needed playground space. 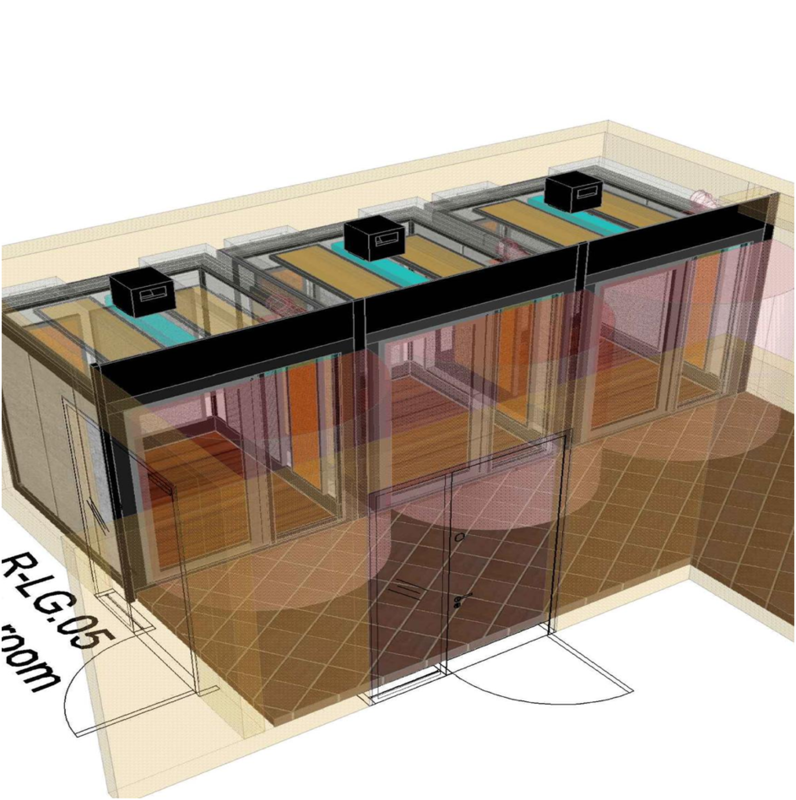 The following visuals show our Computer Aided Design of the Boxy Rooms for this project. Due to client budgeting, space limitation, aesthetics and construction legislation, each new project we undertake is subjective and differs from the last. This is why the design process is of the utmost importance to us and our clients. The first stages of design are where every detail MUST be covered, incorporating diligence and great communication with all parties involved. This is the only way we can offer a bespoke and thorough service to our customers. Plans for 3 x E level Boxy Rooms at Finton House School London. Below shows the excavations and structural supports for the subterranean music department. 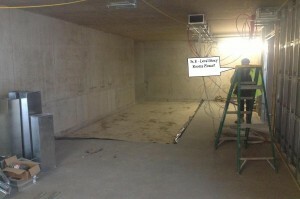 The next Photo shows the new playground, this is basically the lid of the underground music department. Now let’s go down the stairs into the caverns underneath and see where the new rehearsal rooms will be built. The photo above shows where the new Music Pods will be situated. 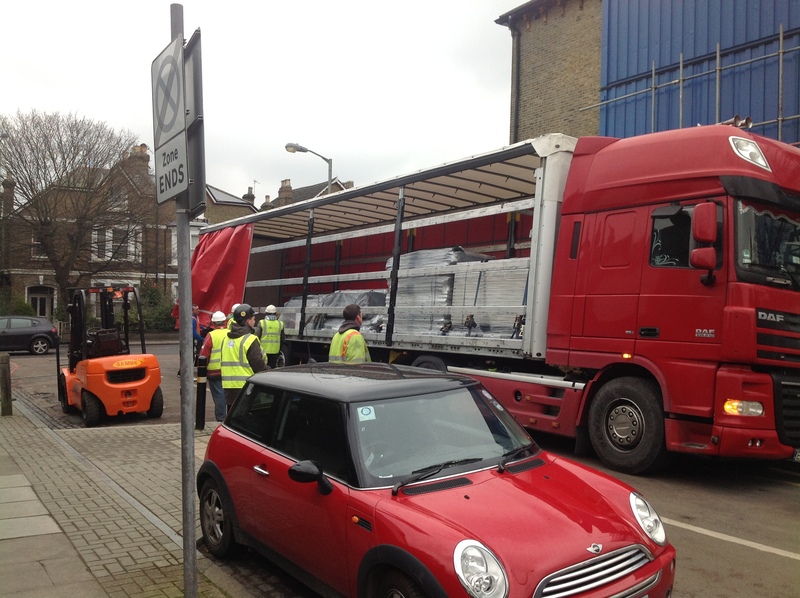 Though first, we need our delivery of prefabricated materials and our forklift truck driver. The build begins with site initiation/inductions, unloading of the trucks from Italy and then work area organisation. 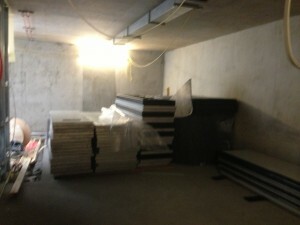 The picture below shows all the floor, wall, and ceiling panels’ stacked and ready for use. 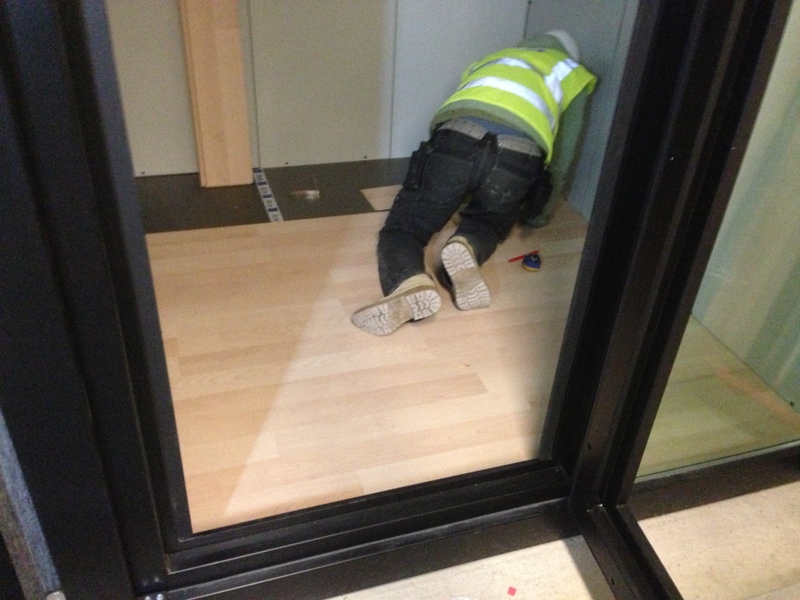 Here we can see the floor being carefully aligned and laid. Thanks have to be given to Buxton Building Contractors for supplying us with beautifully square walls and flooring for our installation. 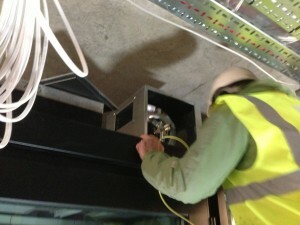 This aspect is critical for proper alignment of our precision engineered studios. 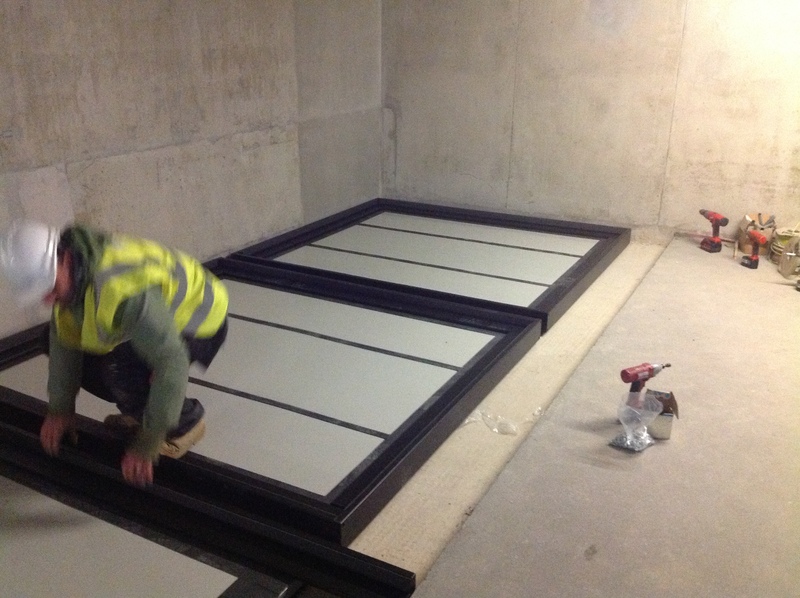 After the de-coupled and acoustically isolated floor has been laid; the main skeleton of the Modular Acoustic Pods can be constructed. We are now only 3 hours into the build and from here the skeleton of the Music rehearsal spaces are beginning to take shape. As shown below. The following picture shows the steel and glass acoustic attenuation panels after installation. 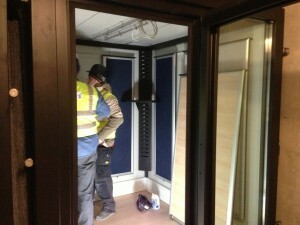 These panels make up the walls and ceilings of the Music pods. Then the hardwood laminate flooring can be laid on a layer of acoustic foam, as seen in the picture below. 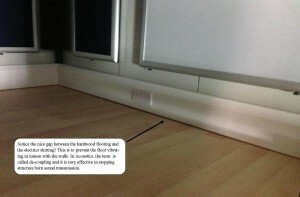 This adds much more acoustic dampening (stops vibrations) to the floor and also helps with thermal insulation. As soon as the acoustic walls and ceilings are finished, the electrics can be installed. 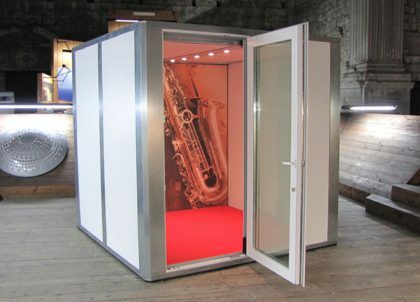 All Boxy Music Rooms are complete stand alone units and come with their own designated electric outlets and lighting, allowing individual control. 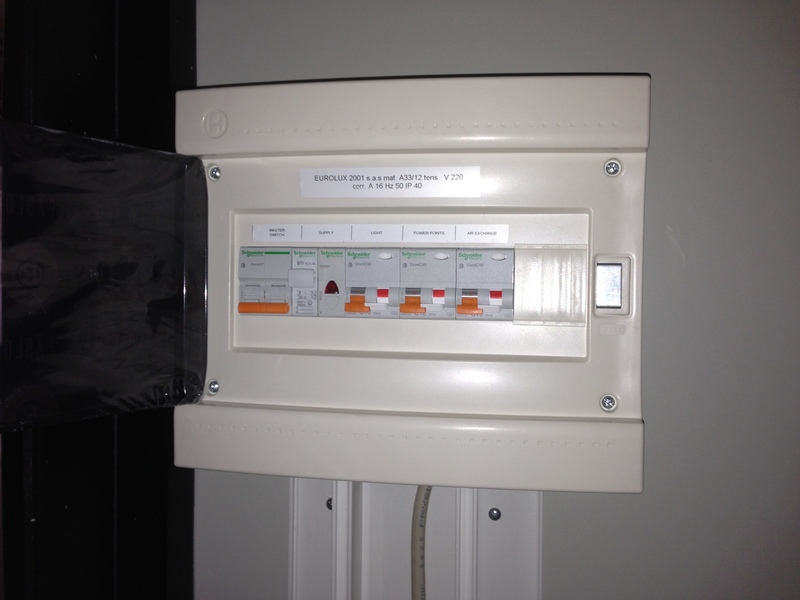 We only need a mains spur, to make the performance space fully operational. 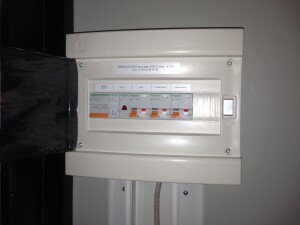 The next photo shows the dedicated fuse box for the room, and then the surface mounted cable skirting follows afterwards. This design of skirting helps to prevent penetration into the wall’s soundproofing material. 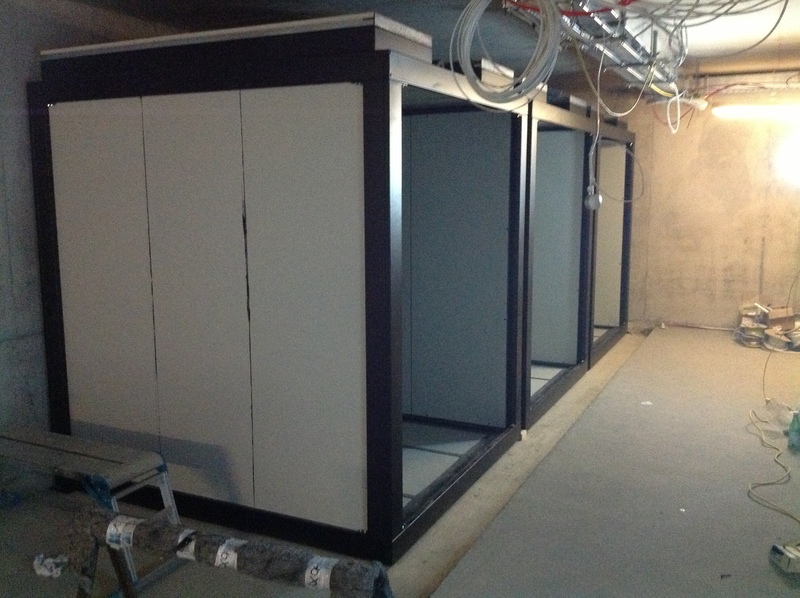 After the electrics installation has been completed, the Sound Reduction Glass and Acoustic Doors can be fitted. This seals the rehearsal space and nearly completes the Pod’s construction. 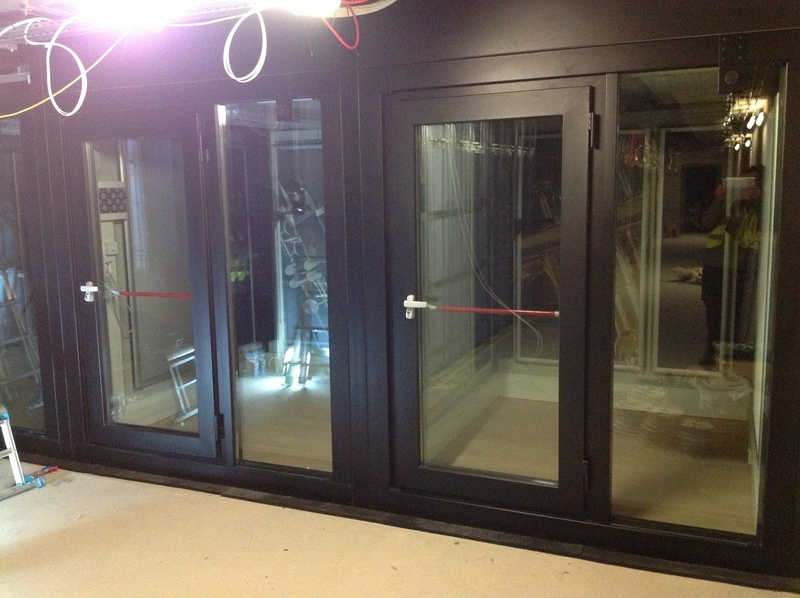 As soon as the doors have been hung and the room has been glazed, the Acoustically Dampened Air Ventilation System can be installed. Depending on room size and use, our sound proof ventilation can create up to 20 cycles of air per hour. This is perfect for long hours of Music performance, tuition and Study, where comfort and alertness are paramount to success. 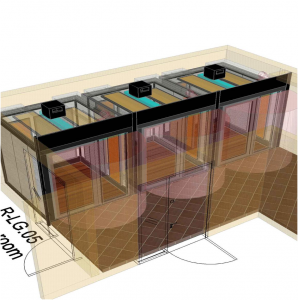 Whilst conforming to strict acoustic criteria for sound transmission and ambient noise levels in schools, the ventilation system is also well hidden. 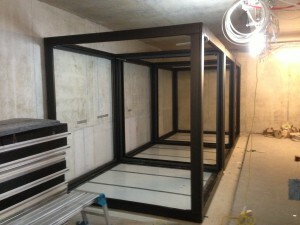 This keeps the turn key design of our Music Spaces looking sleek and stylish. Once the Attenuated Ventilation is complete, the Acoustic Treatment can be installed to tune the room and adjust its sonic responses. 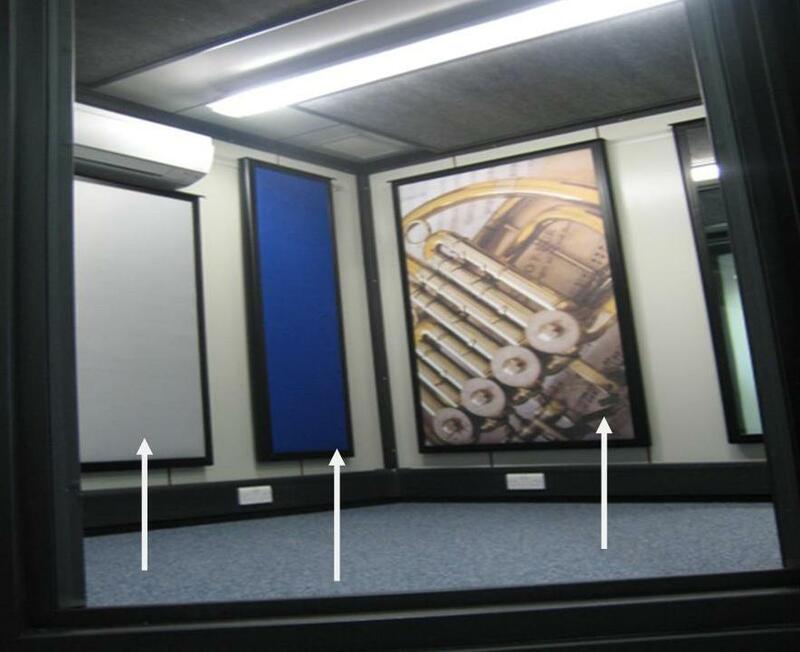 The Boxy Acoustic Correction Panels are unique in the fact that they are both absorptive and reflective panels; all that is required to completely transform your performance space is a simple flip of the panel. You can choose to have a highly responsive and bright sounding room, which has life and vibrance. This is perfect for dynamic instruments, such as strings, singing and woodwind. Then the other end of the scale is to have a totally absorbent mode. This would suit tuition and any spoken word, where less colouring and acoustic interaction with the room is needed. Particularly, vocal booths for television/radio voice over would benefit from this mode. Even drum kits and other impact sound sources would work well in this mode, where the high sound pressure levels and especially the high frequency of the cymbals, would need some dampening to make practice sessions more comfortable. The versatility of the room is almost endless and can be adapted rapidly and easily for different uses. Amadeus can also offer any acoustic panel in a wide range of colours, with a near infinite amount of custom artwork. Below shows a picture of just three styles of acoustic panel finish, these are blue, grey and printed picture. To truly personalise your Acoustic Pod, you can use your own personal photos integrated with acoustic treatment panels. This extra attention to detail is perfect for visually representing the creative work going on inside the room. As long as we are supplied with an image that is the correct high definition of 300 dpi, the end result can be limitless and quite stunning visually. 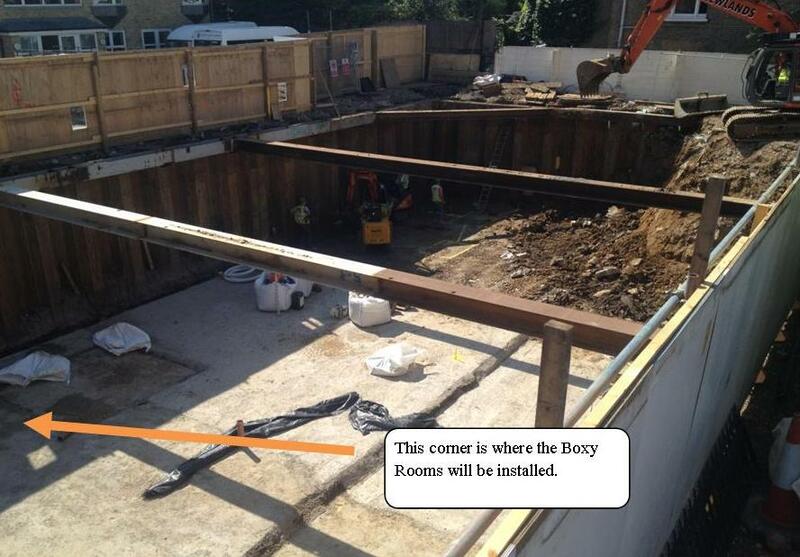 Like the other versatile and UN – permanent aspects of the Boxy Rooms. The Acoustic Panel Art can be changed as quickly and easily as any other normal picture hanging; leaving freedom of expression and ease of use at the head of the game. Once the acoustic treatment has been installed and the final touches have been completed, we give the rooms a thorough clean and polish. In the case of these subterranean studios at Finton House School, we realised that much more construction work would be going on after Amadeus had completed the Boxy Rooms. 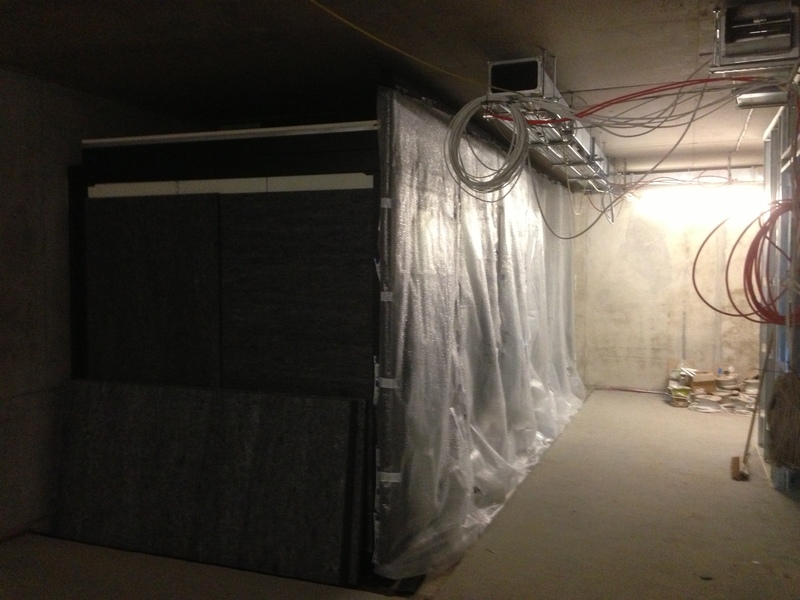 Therefore after locking the doors of the completed pods, we thoroughly covered and wrapped the rooms, so no dirt could find its way in before the grand unveiling of the new Music Department. It’s the perfect Turnkey solution to Music Teaching in School. 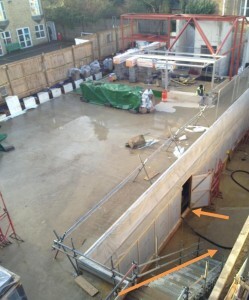 Many thanks to Finton House School, Wandsworth, and to Buxton contractors for featuring in our Case Study.